More than half of charities say that a lack of funding is the biggest obstacle to making digital progress, according to a new report. 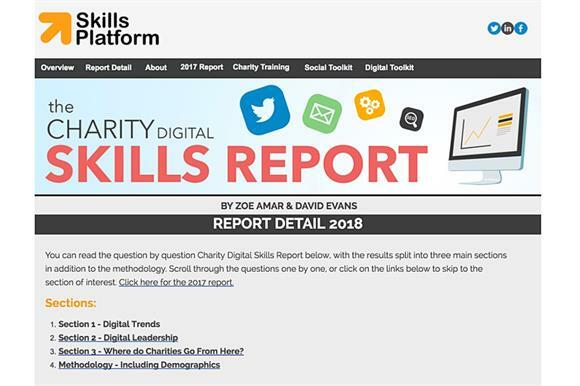 The 2018 Charity Digital Skills Report, published today by the Skills Platform and Zoe Amar Communications, says that funding has overtaken skills as the main barrier to digital progress for 58 per cent of charities, up from 52 per cent in last year’s study. According to the findings, which are based on a survey of 526 charity professionals, slightly more than half of respondents (51 per cent) said skills were an issue in making digital progress, while the lack of change in culture (46 per cent), other priorities (45 per cent) and insufficient infrastructure (45 per cent) were also a problem. A lack of leadership was an issue for more than a quarter of respondents (28 per cent), a figure that showed no improvement on 2017. The proportion of charities without a digital strategy has fallen over the past 12 months, the report says. Last year, 50 per cent had no strategy, but in 2018 the figure had improved slightly to 45 per cent. There has also been an improvement in charities moving ahead with digital: 15 per cent said they had been through a digital transformation process, compared with 9 per cent last year. The proportion of charities that had a digital strategy but said they had not yet embarked on digital transformation remained static year-on-year at 22 per cent, researchers found. The emergence and opportunities offered by artificial intelligence are still not being taken up by the sector, with 73 per cent of respondents admitting to low or very low skills in AI, up from 68 per cent last year. A recent review into AI commissioned by the government estimated that it could add £630bn to the UK economy by 2035. The report’s authors said charities that did not look to develop their capabilities in this area could miss out. Senior leaders’ understanding of digital and the opportunities it could offer has remained a major concern among respondents. More than two-thirds of charities (69 per cent) said their board’s digital skills were low or could be improved, up two percentage points on last year. There has also been a nine percentage-point increase in worries about the lack of leadership support needed to develop more digital products and services (52 per cent). A large majority (63 per cent) said they expected their leaders to understand digital trends and how they affected their charities. The report also addresses the imminent introduction of the General Data Protection Regulation. Researchers found that most of the sector (78 per cent) was either preparing or had already prepared for its launch on 25 May. The report’s authors note, however, that although the majority of charities said they were getting ready for it, handling data was still seen as a skills gap: 62 per cent rated themselves as fair to low with using, managing and analysing data, and 47 per cent rated themselves as fair to low with cyber security. Zoe Amar, director of Zoe Amar Communications, said the results had uncovered a worrying lack of digital progress "across the board". "This includes everything from leadership, skills, culture, embracing emerging tech and a lack of funding," she said. "Although progress is slow, some improvements have been made, including using digital more strategically and getting GDPR-ready, but this slow pace of digital change could be putting charities at high risk of becoming unsustainable and irrelevant." Vicky Browning, chief executive of the charity leaders body Acevo, said senior figures in charities needed to be seen to be on top of the digital agenda. "The report shows that staff increasingly expect leaders to have a good grounding in digital trends and tools," she said. "Ultimately, for CEOs to bring people with them they need to lead from the front in digital." Zoe Amar: Are we at a tipping point in charity digital?